When it comes to shopping for an air compressor, it can be an overwhelming task determining which one you need. Most people just buy smaller ones, but people who do a lot of jobs at their home or professionally need one with a little more power and capacity. When looking for the best 20-30 gallons air compressor, you need to take a lot of different factors into consideration. Making sure that you don’t overpay for features that you won’t need is just as important as making sure you get everything you need out of your air compressor! This may seem like a small air compressor due to its compact size, but don’t let that fool you. It is powerful enough and tough enough to be run in any garage or shop, including some commercial shops. It produces a maximum psi of 135; 5.0 cfm at 90 psi; and 6.0 cfm at 40 psi. The pump life for this unit is 5,000 hours and the noise level is 80 dB, which is fairly quiet compared to similar models. You will enjoy the 2-HP motor that delivers a working psi of 105-135. The pump life is pretty significant because of the durable cast iron construction. When this air compressor is properly maintained and cared for, you will enjoy many years with it. It also comes wired for 115-Volt operation but can be rewired for 230-Volts if you are experienced with electrical work. And possibly one of the most overlooked features is the portability. It comes with flat-free tires that make it easy to move around your shop or garage, and even to multiple job sites. There isn’t too much to complain about when it comes to this 20-gallon air compressor except its price. Everyone who has purchased it has loved using it and raved about its durability and performance. This is one of the top-of-the-line air compressors that any serious worker needs to have. As long as it falls within your budget, then you’d really enjoy having this air compressor in your shop. 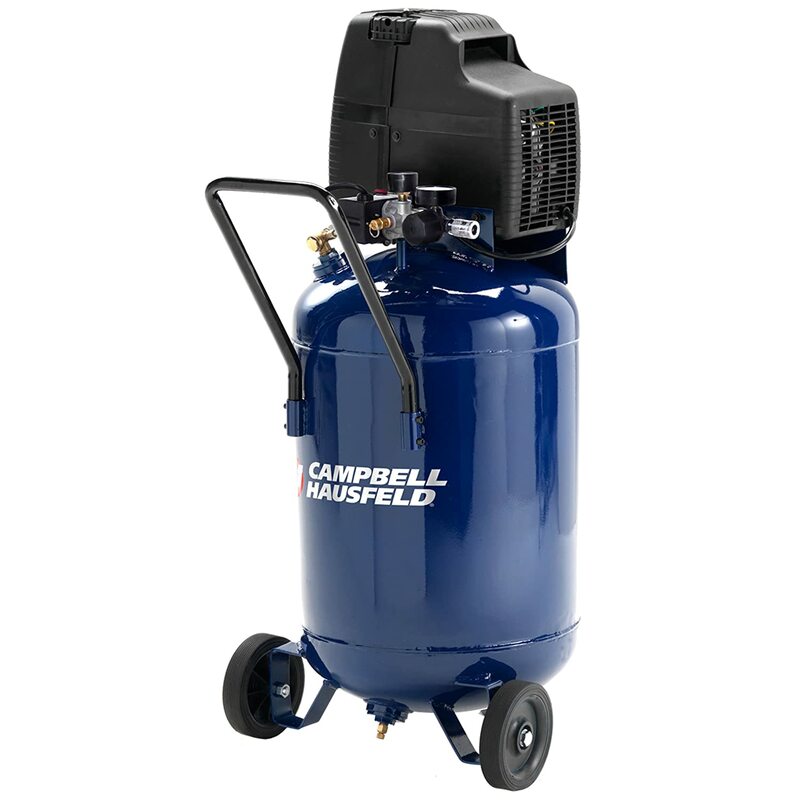 Campbell Hausfeld is widely known as one of the best manufacturers of air compressors. With this particular air compressor, they’ve made it easy for the average person to work like a professional. The 1.3-HP motor can provide a maximum psi of 150 and a cfm of 4.8 at 40 psi. This type of performance makes it easy to inflate and rotate tires, do engine work, maintain lawn equipment, operate air tools and much more. What many consumers like about this air compressor is the low maintenance that it offers. It has an oil-free pump, so you won’t have to worry about changing the oil or maintaining it as much as other models. As a result, you will experience long-lasting performance that can handle some of the toughest jobs. And with the location of the gauges and easy regulator knobs, controlling and monitoring air pressure is a breeze. There definitely are some concerns when it comes to the quality of this air compressor. If you receive it in good condition, then it tends to work well most of the time. However, people have complained that some of the parts break off easily if they get bumped. So if you plan on moving the air compressor around your shop or to different job locations, then you’ll have to be extra careful with it. The price is better than a lot of similar models, but you have to take into consideration the quality as well and determine whether the cheaper price is worth the potential hassle. 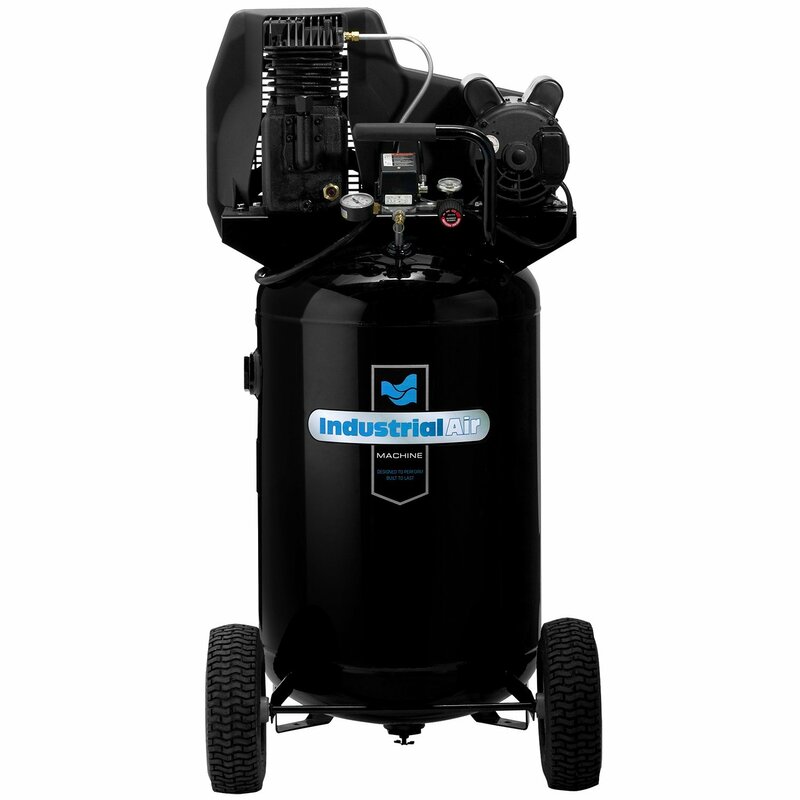 Being a cost-effective air compressor makes this an attractive option, but being a good quality compressor makes it even better. 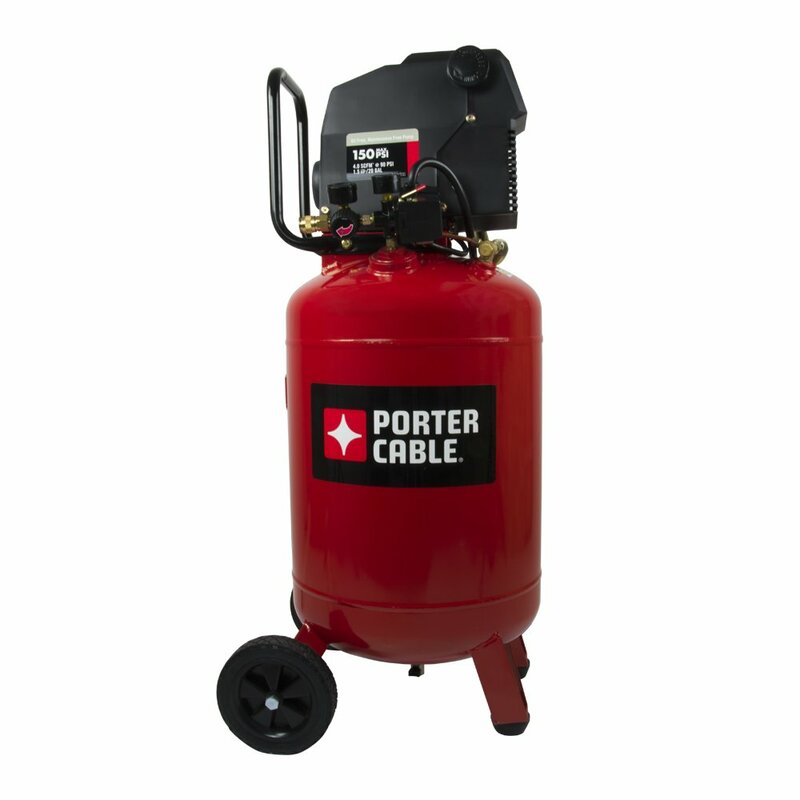 This 20-gallon air compressor produces a maximum psi of 150, including 5.0 cfm at 40 psi and 4.0 cfm at 90 psi. It has a moderately powerful 1.5-HP motor and runs through a 120-Volt electric power supply. The low voltage start up is one of the main things that people enjoy about this air compressor, since it is easier on the motor and prevents tripped breakers. Also, the pump is oil-free, meaning less work for you to maintain it. The motor windings are of exceptional quality and there are no belts or pulleys that have to be maintained or replaced. The result is an efficient-running machine that will withstand many years of hard work. And considering the unit weighs less than 100-pounds and comes with 7” solid rubber wheels, it is easy to move around throughout your shop or garage or to different job sites. This is the perfect air compressor for doing hobbies that require air tools like impact wrenches, nailing, stapling or other home or auto maintenance projects. For being one of the most inexpensive 20-gallon air compressors on the market, the quality of this one is pretty impressive. Of course, there are plenty of benefits to getting a more expensive brand, most notably the power. But for people who just do recreational projects around their house, this is not a bad little air compressor. It will fit in just about any budget and you will be surprised at how well it works! 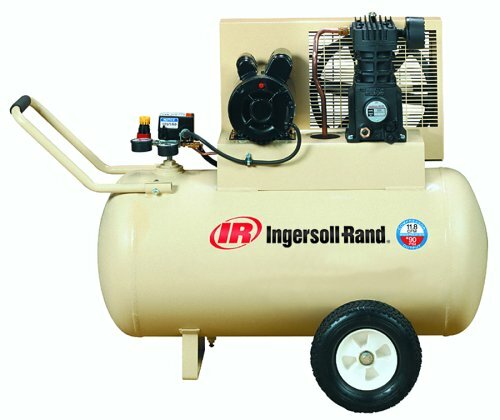 The Ingersoll-Rand brand has been around for many years and is known for manufacturing quality air compressors. This one is no different. It easily produces a maximum psi of 135, including 5.7 cfm at 90 psi. The cast iron construction is one of the most durable materials, so you can ensure it will last a long time, even in harsh conditions. The 100% continuous duty makes it great for job sites where you need a powerful air compressor for an extended amount of time. 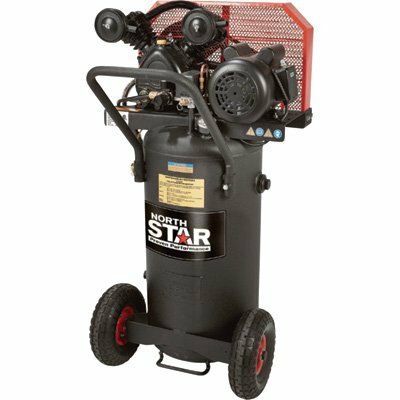 And speaking of power, this air compressor sports a 2-HP motor, which is plenty for using impact guns, paint sprayers, sanders, nailers, grinders and more. The pump is oil-lubricated, meaning you’ll have to perform more maintenance on it, but it is worth it in the long run. The combination of the wheels and the horizontal design also make it easy to maneuver around your house or the job site. You can’t question the quality of this air compressor, but you can question the price. It is a pretty expensive unit for most people, so a lot of the customers include commercial consumers. While it’s pretty easy to move around, most people just set it up in the shop and leave it there. You can’t ask for much more out of a 30-gallon air compressor, so if the price fits in your budget, you will be happy with it. If you’re looking for an air compressor that will complete general home and auto maintenance tasks, then this is a great option in more ways than one. The heavy-duty induction motor will deliver maximum performance and efficiency every time you use it. Plus, it will deliver a maximum psi of 155, including 5.7 cfm at 90 psi and 7.0 cfm at 40 psi. The tank stands vertically, which makes it easy to set it out of the way in the corner of your garage or shop without taking up a lot of space. It also includes pneumatic tires pre-attached for easy mobility. The twin cylinder, oil lubricated pump is made from a durable cast iron, so it’s built to stand the test of time. As long as you properly maintain this unit, you will be able to enjoy it for years to come. Aside from a few design flaws, this may be the most ideal 30-gallon compressor for the DIY’er and the professional alike. It has plenty of power to run most air tools, so you never have to worry about running out of air pressure. The tough thing about buying a large air compressor is the noise level, especially if you’re buying it for your home. This one is pretty quiet when you take everything into consideration, so just about anyone will enjoy it, even if you have noise restrictions in your neighborhood! Anyone who has tools at their home or shop likely has at least one tool with the DeWalt name on it. It is a recognizable brand for tools, and that includes air compressors like this one. It delivers a maximum psi of 155, including 7.0 cfm at 40 psi, 5.7 cfm at 90 psi and a running horsepower of 1.9. The dual voltage motor comes pre-wired for a standard 120-Volt outlet, but it can be converted for 240-Volt applications as well. The 30-gallon tank stands vertically, so it won’t take up much space in your shop or garage. The pre-attached pneumatic tires make it easy to move around the workbench or the job site. The twin cylinder, oil lubricated pump is constructed with durable cast iron, so it can handle just about any work environment. It also comes with synthetic oil, so you’ll be able to fill it up and use it right away. If there’s one thing you can guarantee with any DeWalt brand products, it’s that you’re going to be getting quality equipment. This is a relatively inexpensive 30-gallon air compressor when compared to other models, so it is a lot easier on the budget. And the best part is you aren’t losing a lot of performance for the cheaper price. It’s tough to find anything significantly wrong with this air compressor, so it’s a pretty good choice for any homeowner or professional that needs a quality product to complete day-to-day tasks. 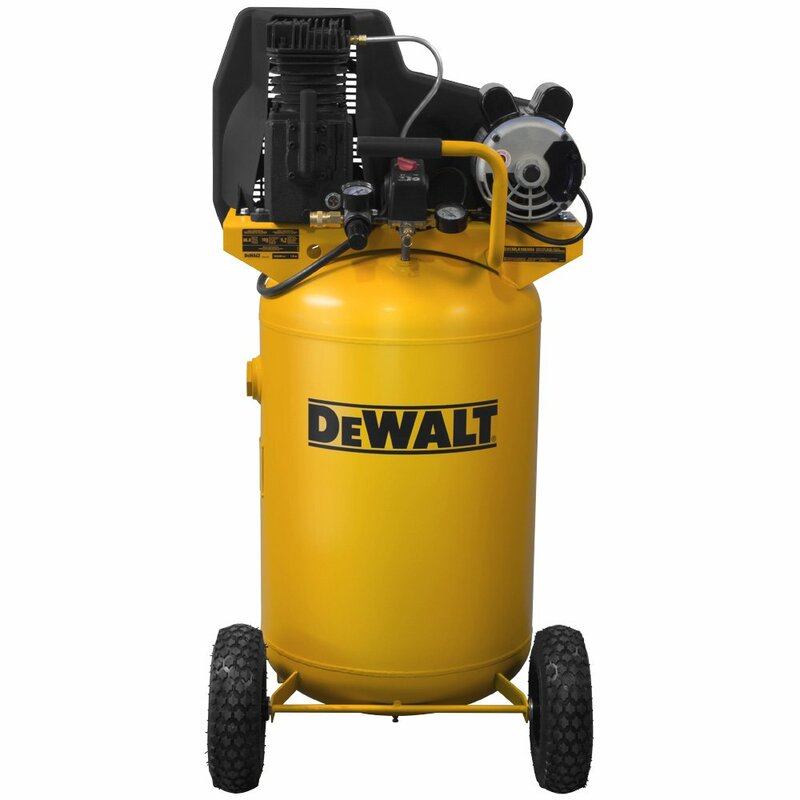 A 20-30 gallon air compressor is right in the middle of the different options that are available. Most people who choose the portable air compressor in this range are homeowners who do a lot of projects like inflating or rotating tires, using staplers or nail guns, impact wrenches or other tools for home and auto maintenance. But there are some commercial uses for this type of air compressor as well. If you won’t be using your air compressor constantly throughout the day, but still need a few hours of continuous use, then this could be a perfect option for your shop. It delivers just as much power as the larger compressors, in most cases, but the tank capacity just isn’t as large. Having a 20-30 gallon air compressor in your shop or garage is ideal because there are plenty of uses for one. Sometimes you just don’t need to fire up the large one, but you need one a little more powerful than smaller portable models. Below you will find our top picks for the best 20 and 30-gallon air compressors, to help you get a better idea of what is available. Now that you know what options are available when it comes to 20 and 30-gallon air compressors, you should be able to make an educated decision on your purchase. The best thing you can do is determine what you need the air compressor for and then look for those specifications. You definitely don’t want to pay more for a compressor that you don’t need, but you also want to make sure you at least have enough to accomplish the jobs you have to do. Since you are more knowledgeable now after reading this article, don’t waste any more time and go buy the perfect 20-30 gallon air compressor for you!